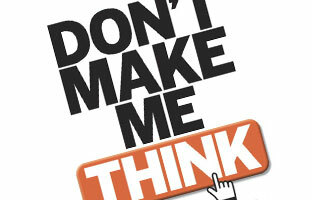 Many people in the usability community regard Steve Krug’s book Don’t Make Me Think: A Common Sense Approach to Web Usability, 2nd Edition as the laypersons usability bible. This book explains briefly and concisely everything one needs to know about getting started with web usability. For more advanced users, it’s a great refresher course. UX Booth has been open for more than half a year now, and when we started I was always regarded as the layperson of the group. After getting all serious about usability, I’ve re-read Steve Krug’s Don’t Make Me Think and pulled out what I consider to be the most insightful and best thoughts in this book. I highly recommend picking up a copy if you get a chance, but here are some things to think about in the meantime. Some are simple and straightforward but worth remembering, some are just phrased beautifully, and some will make you think. Web applications should explain themselves. So what words of wisdom on Usability do you have? What are the best books about Usability that you have read?